Ok, let me give a disclaimer on this one…I don’t really believe in paranormal activity. BUT with Halloween on the horizon, I thought I would shake things up and write about some Georgia hiking areas believed to be haunted. You’ll also get some “behind the scenes” insight into my hiking experiences and maybe you’ll learn a bit of history as well! These are all places I’ve been, so I can attest to their level of haunting or lack thereof. So without further ado, I present you 9 hiking haunts, in order of least likely to most likely to be otherworldy (in my estimation). The Roswell Mill- I was a little surprised about this one (or maybe just naive), although Roswell is a popular place for ghost tours. I’ve been to the mill dozens of times and know lots of people in Roswell who grew up nearby. No one’s mentioned any crazy stories or urban legends about it. Just a really popular waterfall with miles of hiking trails and dozens of couples taking engagement photos. Maybe some of the photographers have captured apparitions in their photos. I’ve also toured nearly every historic home in the area, with no feeling of paranormal activity. But considering Roswell’s terrible Civil War history, anything is possible. Big Cedar Mountain- If you’ve driven up Hwy 60 to Woody Gap, you’ve surely seen the “Stone Pile” in the middle of the intersection. So after someone I was hiking with asked me what it was and I didn’t know, I looked it up. It’s the grave of a young Cherokee girl, Trahlyta (hence the namesake places in the area), who was granted eternal youth by the “Witch of Cedar Mountain”. Trahlyta met a sad end, of course, and the stones mark her grave. Reportedly 2 people have died after moving stones during construction work. I’d be more likely to die of fright while driving around the hairpin turns of Hwy 60 (especially when James is driving) than believe the area is haunted. Sumter National Forest/Moody Spring- Here’s a very special mention for South Carolina. While camping in this area last summer, we noticed a spring coming out the side of a mountain just off the road. It’s a very picturesque sight, so we stopped briefly on our way home from camping and I then looked up the spring. I was mostly wondering about the water quality, but found more than that. Supposedly a ghostly hitchhiker haunts the area, although I was more concerned with potentially finding meth labs while hiking. I also had a frightening experience in the campground outhouse, but it wasn’t of a paranormal nature (yes, I’m going to leave you hanging with this one). Concord Covered Bridge Historic Area- This one I could maybe see being haunted. I mean, the first time I drove through the bridge, it was at night and I was terrified I was going to die after being hit by an oncoming vehicle. The mill ruins at nearby Heritage Park are really creepy looking, mostly because they are completely overgrown and filled with spider webs. There also happens to be a dumpster literally on the trail, which is convenient for disposal of bodies. And walking across the Silver Comet trestle bridge over the East-West Connector literally caused me to feel seasick for no apparent reason. Ok, I’ll stop hating on Cobb County now. George Disney Trail- This gritty little trail in Dalton is located in the middle of a lot of Civil War era history, so it wouldn’t surprise me if it was haunted. Oh and there is, in fact, a Civil War soldier’s grave predominantly located on top of the mountain. Supposedly the ghost of George Disney haunts the area and most recently, I learned the area is patrolled by a group of elves/trolls (maybe they work in the carpet factories also??). Folks I know who grew up nearby in the 70’s have told me other stories about various haunted spots in Northwest GA, but this is the only one I’ve visited myself. While the Disney trail is a little sketchy due to trail degradation, I can’t say for sure it’s haunted. 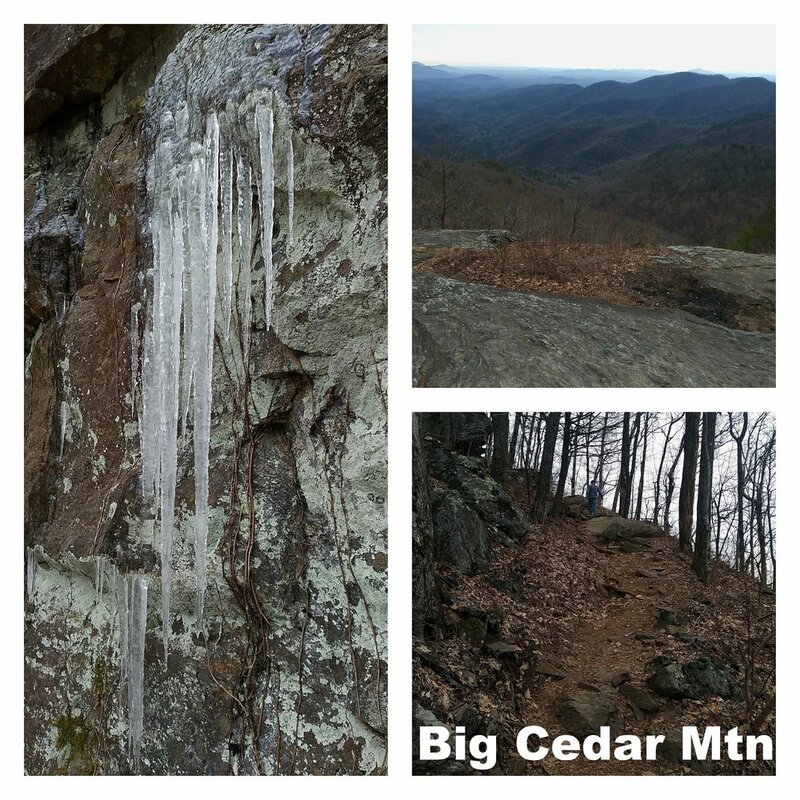 Blood Mountain- The name says it all, right? The ominous name possibly comes from the battles between Native American tribes in the area (along with nearby Slaughter Creek) which left the mountain “painted with blood”. I can tell you, it’s always painted with beautiful red foliage this time of year! It’s been several years since I’ve been to Blood Mountain but my last visit was actually ON Halloween and it happened to be a delightfully chilly, foggy North Georgia day. The Blood Mountain shelter is one of the older ones on the Appalachian Trail and it’s stone construction definitely makes it look haunted. The interwebs also tell me the area is a hotspot for otherworldly creatures. One thing I can say for sure, your heart will race as you hike this 4000+ peak. Sawnee Mountain Preserve- Yep, my own backyard. Sawnee Mountain is near a “magic hill” (Booger Hill) and this one has a dark backstory. While I’ve never tested the hill, there are lots of accounts about it online. There’s also a pile of stones that looks like a grave marker on the south side of the Preserve, but I haven’t been able to verify what it is. The Indian Seats side of the preserve is dotted with old mine entrances, which look totally creepy even in broad daylight, so who knows what kind of haunting may go on in that mountain. Of course, I’ve been there few times at night and never experienced anything weird. I prefer to focus on the peaceful use of the Indian Seats for meditation and such. 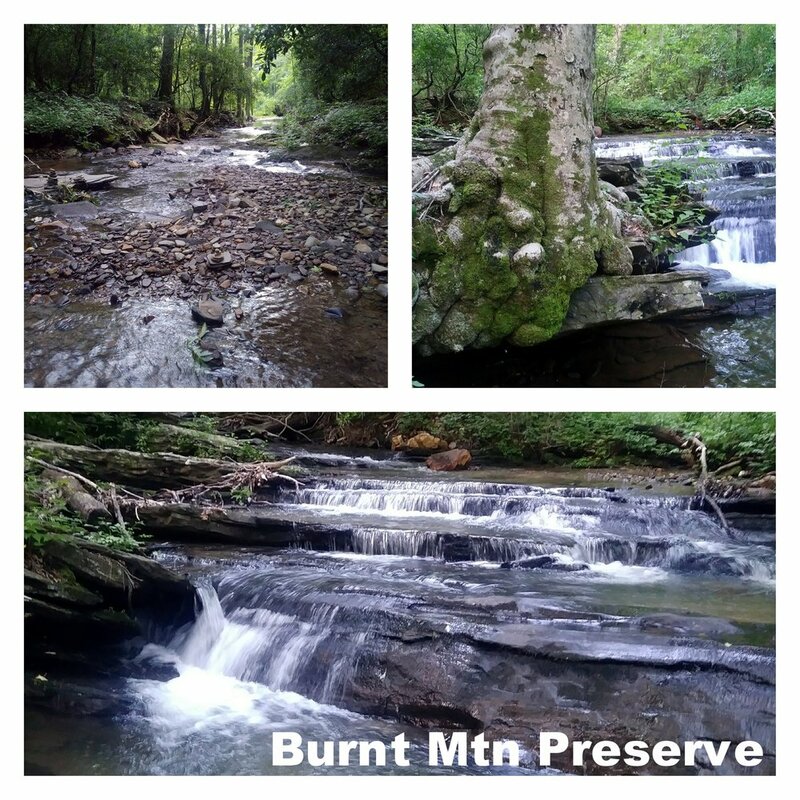 Burnt Mountain- Earlier this year when I was working in Pickens County for a week, I went to the Burnt Mountain Preserve after work. I liked the scenery a lot so I mentioned it to a coworker. She said there were all kinds of creepy things in the Burnt Mountain area and then regaled me tales of the haunted “old hospital” (now the county admin building where I happened to be working that week). It was a very un-traveled and overgrown trail, yet I saw a sort of “lean to” constructed in the woods. Spidy Senses tingling! It also happens to be located near another “magic hill”. I haven’t been back to the preserve, but I have been to nearby Fainting Goat Vineyards and it is definitely haunted…with cute animals! Basically all of Dawson County- No offense to the Dawsonvillains. I am your neighbor to the not so distant south, so I do commiserate with you. And I really like hiking in Dawson County. There are so many hidden and not so hidden gems there. But there is an undeniable sketchy feeling in Dawson County. I’ve hiked all over Dawson and the feeling never goes away. Just driving through the county sometimes freaks me out. Scour the interwebs and you’ll find lots online about the Amicalola Falls Lodge being haunted, not to mention the Area-51 like activity in the Dawson Forest. One last disclaimer, I am well aware of the high profile murders committed in several of the areas I highlighted. I mean, in no way, any disrespect to those affected by them. As fun as it is to talk about campfire ghost lore, the greatest danger in our world comes from other human beings. If you choose to personally investigate any of this further, please be careful and abide by any rules in place. Take extra precautions if hiking at night and always tell someone where you are going. Happy Haunted Hiking!